Professor Leland B. Yeager (University of Virginia and Auburn University) is one of the giants of the generation of economists after Ludwig von Mises. Professor Leland B. Yeager (University of Virginia and Auburn University) is one of the giants of the generation of economists after Ludwig von Mises. He was Mises's student and translator - and has made a lifetime of contributions to policy, theory, method, ethics, and aesthetics from the point of view of a champion of freedom and a deep respect for the Austrian tradition. This vast collection is a tribute to the range of his brilliance and erudition, and a reminder that his contributions are enormous. Many of the essays found herein are nearly lost or unavailable. Yeager selected them with an eye toward the essays that most pertain to the Austrian tradition and the moral imperative of the free society. The title essay is one of the more controversial articles to ever appear in economic literature. It began as a response to the criticism that if Misesian economics were so great, it would be the market leader within the profession. 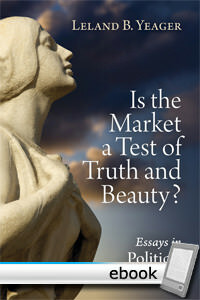 Yeager responds with a general theory of market dominance and its relationship to issues of truth and beauty. He argues that we cannot use the market as the final test to determine aesthetics or the value of truth claims. These must come from outside market analytics. The essay offers a profound clarification of the role of economics and markets. And it is an archetype of the type of thinking that Yeager has published through his long career. He is an iconoclast, a truly independent thinker with a bold way of approaching core issues. Even where one disagrees, he helps advance careful thinking and rigorous analysis. The essays are unfailingly interesting, and note that one of them is actually in the language called Interlingua (Yeager briefly served as president of the Interlingua Society). It is probably the first and only English-language book on economics to include such an interesting item. His many students through the years have hoped for a volume with his most interesting, provocative, and thrilling essays - and it is here at last. This book will more firmly entrench his reputation as a giant within the Austrian oeuvre. Should Austrians Scorn General Equilibrium Theory? Is There a Bias Toward Overregulation? Can a Liberal Be an Egalitarian?